Engineering Weldmesh is used for its strength and versatility, there are few engineering materials to rival Weldmesh. This famous name has become a by-word for welded steel mesh all over the world. Weldmesh is a specialist product and is widely specified for a multitude of uses throughout industry, building & construction, agriculture and horticulture. Manufactured from bright drawn mild steel wire, the mesh is electrically welded at each intersection. 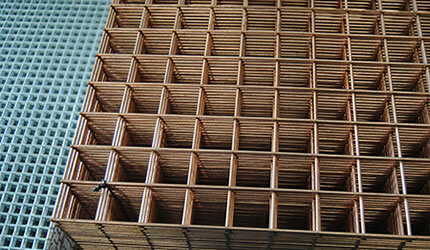 After manufacture it can either be galvanized plastic coated or remain in its original finish – copper coated. Weldmesh is also produced from either light galvanized or heavily galvanized wire depending on the final application of the product. Gauge Sizes: dimensions shown are for galvanised wire. Weldmesh self-colour specifications will vary between 0.04mm and 0.12mm below the galvanised wire dimension as shown in the Weldmesh Gauges Guide. Galvanised Weldmesh: through our unique smooth inline galvanised process, Weldmesh is hot dip galvanised to the highest standards and conforms to BS EN 10244-2 Class A. Should a thicker coat be necessary, i.e. BS EN ISO 1461 (replaces BS729), this can be obtained on request. Pre-galvanised Weldmesh (mesh made from galvanised wire) can also be produced on request.